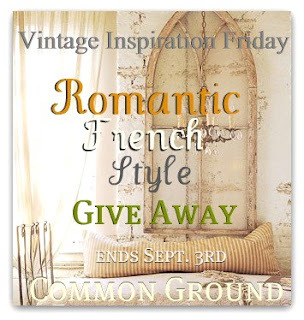 common ground : Vintage Inspiration Friday, Birthday Give Away starting tomorrow! 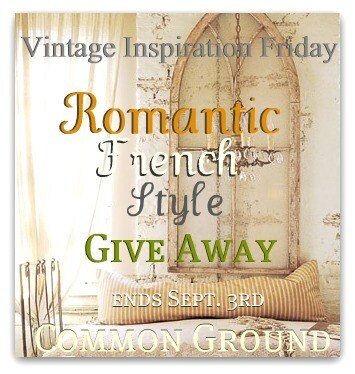 Vintage Inspiration Friday, Birthday Give Away starting tomorrow! but you can grab the button on the sidebar today! but you can still say Hi, today! p.s. thank you for all the great advice for Charlotte's Great Room!! If you haven't checked in, just scroll down for her Design Challenge post. Hi today:) HUGS! Enjoy your evening! Hi Debra! Just stopping in to say I'm grabbing your button and I look forward to it! Looks exciting! I need to get my photos ready for Friday, loving your vintage party! sun is shining here at last, so lovely. Hi, hope your day is wonderful! I'll be back. Hi again, just grabbing your button! See you tomorrow. Have a wonderful funfilled day! hope your gorgeous necklace is the giveaway, friend! Hi Debra, I will grab your button and post it on my blog. How exciting! I so enjoyed reading the advice from your sweet bloggers. Thanks so much for your tips also. I have decided to paint the coffee table as you suggested in an antique white or cream and then sand some off in areas. the arranging of items on my fireplace and book shelves present a challenge, but one of your friends suggested looking at design books to get ideas which I will do. Hi! I would love to join your giveaway!!! I have linked up this week! ;) Thank you so much for hosting! I am a follower!! love your blog! Love your blog! Would love to join in on the giveaway!! I love your new orange!!! One of my favorite colors! Thanks for hosting this giveaway! Would love to win. I love your books. Have a safe and happy Labor Day Weekend! I love to read your blog. Thank you for the chance to win this great book! Love your blog...give and it shall be given to you ! Thanks for sharing so many WONDERFUL ideas. Fall colors are such happy ones..I love them too. Please enter me in your great give away ! I really like your blog and I would love to win your giveaway. It would make a great belated birthday present to me. I am one of your followers. Your Missouri Friend. Please count me in for the giveaway! I would love to sit down with a glass of wine and read a little. Can't believe I almost missed this. I'd love to be entered in your giveaway. I'm a follower of your blog and I always enjoy visiting! Hi Debra, I will grab your button and post it on my blog. How exciting! Been a follower for a while now! Hi Debra, have been a follower for awhile! Love your beautiful blog. Would be honored to be included in your giveaway, Thanks. thank you for the chance to win your giveaway! Have a wonderful evening. I would love to enter your giveaway....please count me in. This is great!I'm on time, Please count me in! I really enjoy your site and the postings you share. I would love to be included in your give away. I will attempt to grab your button, but I am still learning so we will see what happens!! Love that necklace! I always find your blog fun to follow. I love Ozark, Mo and all the shops there. We use to live in the Ozarks and my daughter and I would stop on the way to Branson. I will look for your shop the next time we come to town. What a gorgeous give-away! I would be honoured to win something from your beautiful blog.